Though the PSD2 regulation is set to revolutionise the banking industry, it also introduces new fraud risks for financial institutions. These risks raise the question once again of how banks, payment providers and merchants can deliver excellent customer experiences without compromising security. PSD2’s Strong Customer Authentication (SCA) section requires two factors for authentication. At the same time, financial institutions and online merchants are challenged with delivering good user experiences or risk losing customers. 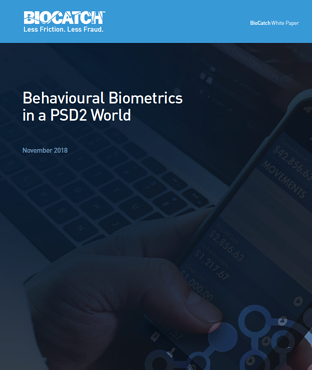 Behavioural biometrics fall under inherence and is the best way to introduce strong security without customers feeling an adverse effect on the user experience. Behavioural biometrics work in the background to build up profiles based on a user’s unique actions. How do they type or click? How fast do they move a mouse? Any deviations from the norm alert a bank to possible fraudulent activity. This lets banks and third-party payment providers (TPPs) meet PSD2’s authentication requirements as well as stop account takeover attacks in the initial authentication process or when a user has to re-authorise after a 90-day token expires. The PSD2 regulation is an opportunity for banks and TPPs to lead the way to stronger authentication and fraud prevention strategies that will put them well ahead of their peers as the shift to the digital channel continues. Innovations like behavioural biometrics are the way to stay competitive, increase customer trust, and build a world where our payment systems are as user-friendly as they are secure.